We flock to Greece's famed Ionian, Saronic and Cycladic islands, but reclining like a goddess off the pointy end of Croatia is Brac, isle of stone and sea, whose bountiful attributes are sometimes overlooked in the rush to Mykonos and Santorini. 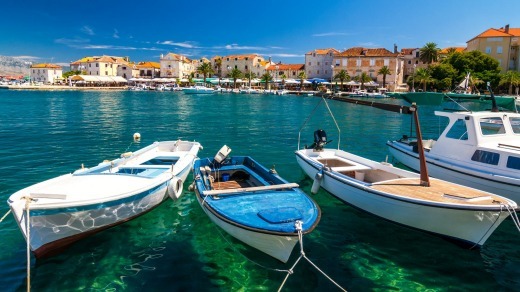 Brac is the Adriatic's tallest isle, with its limestone massif, Vidova Gora, soaring 778 metres, affording views not just to other Croatian archipelago islands like Hvar, Korcula, Vis, Bisevo and Jabuka, but also to Italy on a clear day. From this majestic viewpoint, you can gaze down on Croatia's (some prone to hyperbole might say the world's) most gorgeous – but also sneakiest – beach, the Golden Horn or Zlatni Rat. Gorgeous because its aesthetically pleasing promontory pierces the vivid Adriatic for 430 metres like a golden scimitar. Sneaky because if you fall asleep there, you may end up under water. This white-pebble spit of land that extends southwards into the Hvar channel curls slightly eastward. But when the southeasterly Jugo wind howls up from the Sahara, the beach shifts west, changing its shape. When this golden cape is not plotting to inundate snoozing sunbathers, the regular summer northwesterly mistral wind renders it a popular windsurfing spot. 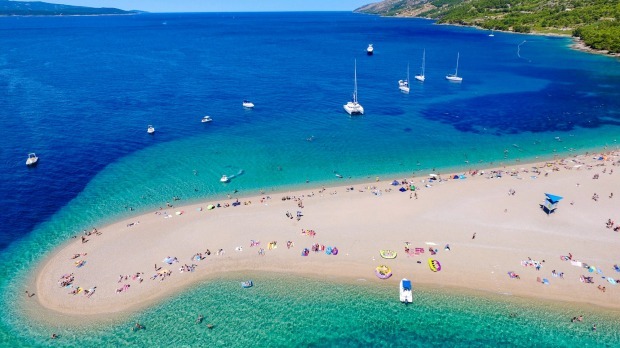 Zlatni Rat is protected in Croatia as a unique geomorphological phenomenon. It pops up regularly on Croatian tourism brochures. We've come to Brac, a place of exquisite white marble, lamb dishes to delight (and occasionally appal – see breakout), sublime olive oil and a "malo pomalo" (take it easy) Dalmatian philosophy as part of our Ponant Le Lyrial small-ship cruise from Venice to Athens. Brac (pronounced Bra-ch), 12 kilometres wide and 40 kilometres long, is the third largest of the more than 1000 islands in Croatia's archipelago. It's just 11 kilometres to mainland Split and ferries and catamarans run up to 16 times daily in the summer. Its 15,000-strong population trebles for the short summer season before the islanders sink back into their "malo pomalo" traditional ways of farming, stonemasonry and fishing. We step ashore in the pretty town of Bol on the warmer, southern side of Brac (and incidentally one of the Adriatic's sunniest locations). Our guide Leo is an aficionado not just of Croatian, Dalmatian and Brac history and politics, but also of art, wine and culture – and there's a lot of all that. Brac has been inhabited since Neolithic times but records begin with the Illyrians. The name comes from the Illyrian word Brentos, meaning deer. The Greeks arrived and called the island Elafusa, from the word Elaphos, also deer. Then the Romans dubbed it Brattia, a reference to the island's goats. Since then, Brac has been ruled by Bosnian kings, Venetians, Austrians and the French. Islanders fiercely resisted World War II Italian fascist occupation. Villages were burned, villagers shot, imprisoned and interned until liberation in 1944. Croatia gained its independence in 1991. It's a steep, picturesque and bendy ascent from Bol towards the island summit. Bol, its 15th-century Gothic-windowed palace, two renaissance citadels, Dominican monastery and Zlatni Rat retreat below us and little dancing boats fade to dots in the secluded port. The temperature drops as we gain altitude sharply on this steep side of the island, rising through the coastal Aleppo pines and macchia evergreen shrubland. Vineyards appear, incubators for the island's plavac mali red grapes – similar to zinfandel. Swathes of grey-green olive trees cloak the valleys, thanks to the 16th-century Venetians. They decreed that a man could not marry unless he planted 100 olive trees. Severe penalties applied to those damaging trees. The warmer version of a Mediterranean climate also means Brac produces luscious figs, mandarins, marasca sour cherries and almonds. But this is only thanks to the women of Brac whose backbreaking work cleared the land for agriculture. Those scatterings of rocks are a monument to their labour. There are also, it must be said, one or two sheep on Brac. Well, about 25,000 to be exact. They look nervous, understandably, for eating them is a Brac passion, from their little noses to their woolly tails. But it's the tuna that should be really nervous. The Adriatic's Atlantic bluefin tuna, the "diamond of the sea", is so desired for its rich and fatty texture, overfishing has massively depleted stocks. Croatia's tuna is now farm-fattened, ending up as toro – precious fatty raw tuna – on Japanese tables. We have played king-of-the-castle atop Vidova Gora and now head with Leo to Pucisca, one of Brac's northern coastal quarry towns where pure white limestone is extracted to fuel the island's 3000-year-old stonemasonry tradition. The Romans used this exquisite marble for temples, cities, amphitheatres and palaces all over Dalmatia. The fourth-century emperor Diocletian's 1700-year-old palace in Split (Danaerys's throne room in Game of Thrones) is built from Brac stone, as is part of the White House, and a host of historic European buildings. The stone is still highly prized and we have come to Pucisca to understand the island's marble story. Pucisca's harbour is an unearthly blue, throwing into stark contrast the gorgeous pale-stone buildings that line its wharves. One among these buildings is The Stonemason School, founded in 1909, which takes 25 students annually for the three-to-four-year courses. Its aim is to pass on the noble art of stonemasonry and entry is competitive. A fine white dust hangs in the workshop air and the semi-completed urns, windows, fountains, columns and sculptures litter the floor. Some are hammered, sanded and chiselled to intricate forms, all in the almost unearthly alabaster white or yellow sheen of Brac limestone. Back in Bol, the 15th-century Dominican monastery, with its exquisite gallery and altar painting in the Tintoretto style, is closed. Leo instead takes us to the Branislav Deskovic Fine Arts Gallery. Named after an important contemporary Croatian sculptor, the gallery is housed in a renaissance-baroque building at the port. The young, knowledgeable curator guides us through one of Croatia's most significant displays of Croatian modern art. Paintings and sculptures reflect the sense of what it is to be "Mediterranean, southern and temperamental". The collection has Croatian cultural heritage status. It would have been lovely to visit the village of Murvica five kilometres west of Bol but time is short. An hour's uphill hike above Murvica is a series of limestone caves, including Dragon's Cave, with its carved dragon's head and other weird forms. When the Ottoman Turks swept into Croatia at the beginning of the 1th century, the monks fled to higher ground, settling in the caves. We will have to return but for now, the Le Lyrial tender awaits and cocktail hour beckons. Next stop Dubrovnik. • Vitalac – delicious to some, disgusting to others – a big skewer of offal (lungs, liver and heart) barbecued, then wrapped in lamb intestines and cooked for another hour. Unique to Brac and one small Crete village. More palatable might be Butalac – stuffed lamb, rubbed with aromatic herbs and suffused with wine or tingul – braised lamb. • Brac's rare indigenous buhavica olive, which grows on the eastern side of the island. Only about 50 trees exist around Novo Selo and oil costs a bomb. • Smutica, bikla or donkata is made from fresh goat's milk, soured with red wine and apparently has an "unforgettable" taste, known to scare children. Hippocrates recommended it to restore strength and mood. • Hrapocusa is known as "the Brac aphrodisiac" – a traditional cake made from a kilo of walnuts, 20 eggs, about a kilo of sugar, orange peel, rum and a secret spice. The annual "Night of Hrapocusa" celebrates the cake in the village of Dol. • The Brac cheese procip​ is made from fresh sheep's milk, sliced within 24 hours and baked in caramelised sugar. Varenik is a thick, dark brown non-alcoholic nectar made from the must of black grapes. • Mljet near Dubrovnik is pristine, famed for its lovely lakes and dense forests of Aleppo pine and evergreen oak. Ferries connect to Dubrovnik. • Korcula's walled, medieval Old Town is a Dubrovnik miniature. Visit The Land Gate, Cathedral of St Mark, Town Museum and Abbey Treasury before exploring further afield. Reportedly the birthplace of Marco Polo. • Hvar has a more affluent feel with restaurants, outdoor cafes and art galleries. The island's town of Stari Grad is one of Europe's oldest and forms part of the Star Grad Plain, a world-heritage site. • Dugi Otok is further north off the ancient city of Zadar. Dramatic cliffs and wild, natural beauty. Great for outdoor activities like climbing, hiking, cycling, fishing or scuba diving. Day trips from Zadar. • Krk is often called "the golden isle" and is the nearest island to Western Europe. Croatia's largest island is handily connected to the mainland via bridge. Le Lyrial's Discovery of Dalmatian Shores eight-day Athens to Venice departs July 21 or August 7, 2018. From $3660 per person double occupancy – book now to save up to 30 per cent. Includes private balcony, all meals, open bar. See au.ponant.com/ or phone 1300 737 178. Alison Stewart was a guest of Ponant and Emirates.